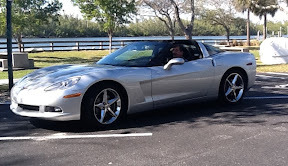 We took a long weekend trip to Florida to remind ourselves about sunshine and to see a few birds that migrated south. When we got to the rental car counter, Mike decided to upgrade to a convertible. We were a bit too early to check in at the hotel, so we decided to go to Brian Piccolo Park to see if we could find burrowing owls. This is a small park, mainly for soccer, baseball, jogging and skateboarding, just outside of Ft. Lauderdale. 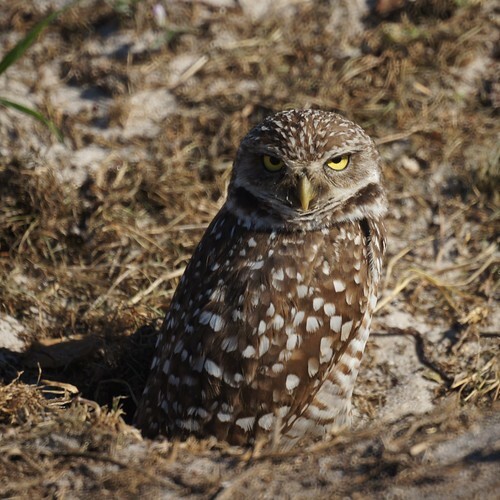 It happens to attract burrowing owls, and there are about 10 owl nests burrowed into the ground leaving small mounds of dirt that make them easy to find. The nests are scattered around and mostly on the side of the roads within the park. The park has each nest roped off to protect it. After a few minutes, we figured out where the nests were, but we didn't see any owls. We drove from nest to nest and then noticed there were a few other cars with retirees cruising the area as well. A little different experience than cruising Ft. Lauderdale at spring break in the 70s. 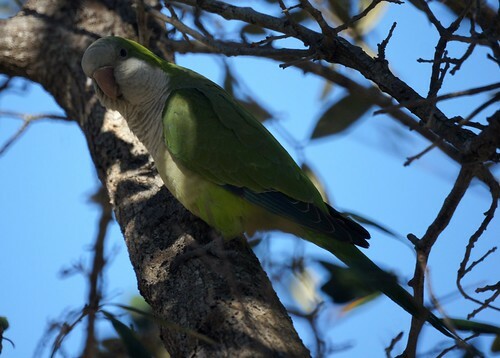 We did see some monk parakeets however. Anyway, we went out for lunch and to pick up some champagne for mimosas the next morning, came back and now that it was a bit later in the afternoon, we saw two active nests. Unlike most other owls, they are active in the day but they do avoid the noon heat. At Brian Piccolo Park, owls are accustomed to cars and joggers going by, so they don't mind a little activity near the nests and are easy to observe. As we left one nest, we saw some sand that the owl was throwing, and when we returned to get a photo, he was back in his burrow. We read that in spring you can see the owls standing outside the burrows with their chicks. 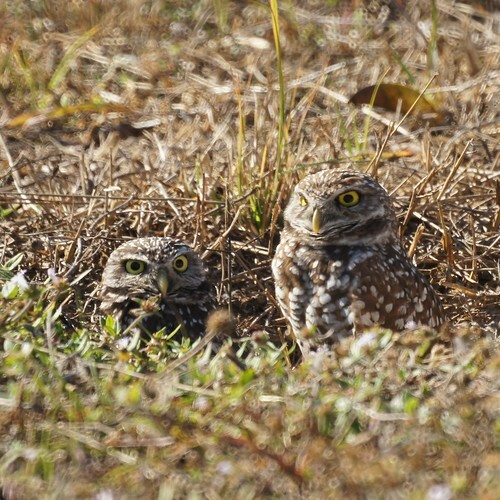 These owls were featured in the book and movie Hoot about a group of school children trying to stop the construction of a restaurant near the Burrowing Owls' habitat in Florida.